A newspaper article written by Grace Marie Stinecipher's column in The Sanford Herald. This particular issue featured school news found in The Sanford Builder's edition from April 20, 1952. Originally located at 301 West Seventh Street in Sanford, Florida, Sanford Grammar School was first established as Sanford High School in 1902. The building was designed by W. G. Talley in the Romanesque revival style. Due to an increasing student population, a new school building was constructed on Sanford Avenue in 1911. The original building on Seventh Street served as Westside Grammar Elementary School, which was later renamed Sanford Grammar School. In 1984, the building was placed on the U.S. National Registry of Historic Places and converted into the Student Museum. The building reopened as the University of Central Florida's Public History Center in 2012. In 1927, a high school campus was designed by Elton J. Moughton in the Mediterranean revival style and constructed at 1700 French Avenue. The school reopened on January 10 and was renamed Seminole High School. In 1960, the high school moved to a new campus at 2701 Ridgewood Avenue and the former building on French Avenue was converted to Sanford Junior High School, which was later renamed Sanford Middle School. The old building was demolished in the summer of 1991 and replaced by a $5.77 million school complex. As of 2013, Seminole High School offers various Advanced Placement courses, the Academy for Health Careers, and the International Baccalaureate Programme for students. 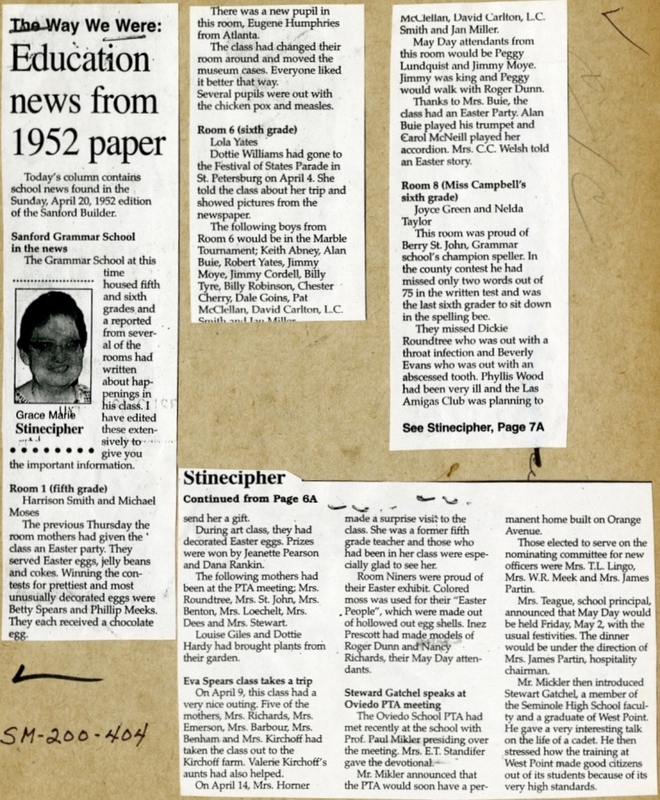 Original newspaper article by Grace Marie Stinecipher: The Sanford Herald, page 6A-7A. 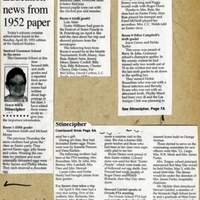 Digital reproduction of original newspaper article by Grace Marie Stinecipher: The Sanford Herald, page 6A-7A. Originally created by Grace Marie Stinecipher and published by The Sanford Herald. Today’s column contains school news found in the Sunday, April 20, 1952 edition of the Sanford Builder. The Grammar School at this time housed fifth and sixth grades and a reported from several of the rooms had written about happenings in his class. I have edited these extensively to give you the important information. The previous Thursday the room mothers had given the class an Easter party. They served Easter eggs, jelly beans and cokes. Winning the contests for prettiest and most unusually decorated eggs were Betty Spears and Phillip Meeks. They each received a chocolate egg. There was a new pupil in this room, Eugene Humphries from Atlanta. The class had changed their room around and moved the museum cases. Everyone liked I better that way. Several pupils were out with the chicken pox and measles. Dottie Williams had gone to the Festival of States Parade in St. Petersburg on April 4. She told the class about her trip and showed pictures from the newspaper. The following boys from Room 6 would be in the Marble Tournament; Keith Abney, Alan Buie, Robert Yates, Jimmy Moye, Jimmy Cordell, Billy Tyre, Billy Robinson, Chester Cherry, Dale Goins, Pat McClellan, David Carlton, L.C. Smith, and Jan Miller. May Day attendants from this room would be Peggy Lundquist and Jimmy Moye. Jimmy was king and Peggy would walk with Roger Dunn. Thanks to Mrs. Buie, the class had an Easter Party. Alan Buie played his trumpet and Carol McNeill played her accordion. Mrs. C.C. Welsh told an Easter story. This room was proud of Berry St. John, Grammar school’s champion speller. In the county contest he had missed only two words out of 75 in the written test and was the last sixth grader to sit down in the spelling bee. During art class, they had decorated Easter eggs. Prizes were won by Jeanette Pearson and Dana Rankin. The following mothers had been at the PTA meeting; Mrs. Roundtree, Mrs. St. John, Mrs. Benton, Mrs. Loechelt, Mrs. Dees and Mrs. Stewart. Louise Giles and Dottie Hardy had brought plants from their garden. On April 9, this class had a very nice outing. Five of the mothers, Mrs. Richards, Mrs. Emerson, Mrs. Barbour, Mrs. Benham and Mrs. Kirchoff had taken the class out to the Kirchoff farm. Valerie Kirchoff’s aunts had also helped. On April 14, Mrs. Horner made a surprise visit to the class. She was a former fifth grade teacher and those who had been in her class were especially glad to see her. Room Niners were proud of their Easter exhibit. Colored moss was used for their “Easter People”, which were made out of hollowed out egg shells. Inez Prescott had made models of Roger Dunn and Nancy Richards, their May Day attendants. The Oviedo School PTA had met recently at the school with Prof. Paul Mikler presiding over the meeting. Mrs. E.T. Standifer gave the devotional. Mr. Mikler announced that the PTA would soon have a permanent home built on Orange Avenue. Those elected to serve on the nominating committee for new officers were Mrs. T.L. Lingo, Mrs. W.R. Meek and Mrs. James Partin. Mrs. Teague, school principal, announced that May Day would be held Friday, May 2, with the usual festivities. The dinner would be under the direction of Mrs. James Partin, hospitality chairman. Mr. Mickler [sic] then introduced Stewart Gatchel, a member of the Seminole High School faculty and a graduate of West Point. He gave a very interesting talk on the life of a cadet. He then stressed how the training at West Point made good citizens out of its students because of its very high standards. Stinecipher, Grace Marie. “The Way We Were: Education News From 1952 Paper.” RICHES of Central Florida accessed April 22, 2019, https://richesmi.cah.ucf.edu/omeka/items/show/4689.